Camden Buescher plays a pass. The senior midfielder collected a hat trick Friday. In a night honoring the accomplishments of the players graduating this school year, there was plenty to celebrate. And no one celebrated more than midfielder Camden Buescher. 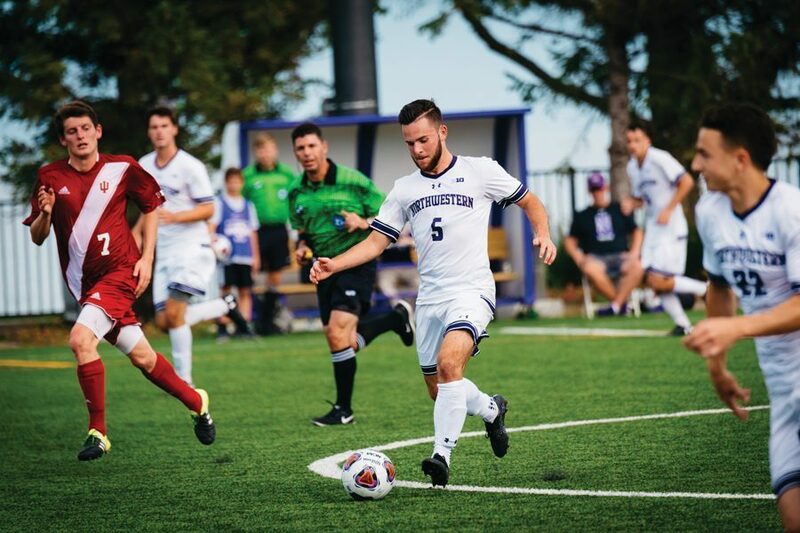 The senior from Toledo, Ohio, scored three goals and added an assist to the stat sheet in Northwestern’s 6-0 win over Concordia-Chicago. For the Wildcats, it’s the first hat trick for a player since Joey Calistri in 2013. Against an inferior D-III opponent, NU (5-8-5, 0-5-3 Big Ten) possessed the ball for most of the game and outshot the Cougars (3-12) 26-3, while taking nine corner kicks. The Cats came out of the gates firing. With all of the seniors starting except for senior goalkeeper Robbie White, senior defender Jake Roberge scored his first goal of the season off of a corner kick by his fellow classmate Buescher in the 20th minute. Buescher’s dominance continued as he scored his first goal of the game five minutes later off an assist from junior midfielder Matt Moderwell and senior midfielder Emmitt Gordon. Two more goals from freshman forward Jose Del Valle and Moderwell pushed the game to 4-0 before Buescher got back in on the scoring. On a set piece from the left side of the box, Buescher curled the ball over three leaping Concordia-Chicago players and the ball landed in the bottom-left corner of the net for the second goal of the game. In the 76th minute, Buescher stole the ball from Cougars defender Brandon Rivera and had a one-on-one with the goalie and put it past his outstretched arms to complete the hat trick. Senior goalkeeper Braden Thuraisingham, along with White, each played a half in goal and combined for a two-save shutout. With the win, NU snapped its 11-game winless streak and secured its first victory since Sept. 9. This senior class has won 25 matches over the course of the past four years. Heading into the Big Ten Tournament, the senior class has one more chance to be a Cinderella story. Lenahan said the seniors could come out with a sense of urgency, knowing that their next game could be their last. Despite what is ahead for the Cats, Lenahan said their play on senior day can be a source of pride.